THE COPTIC MAGICAL PAPYRI BLOG: Anthropology of Magic I: Darwin, Tylor, and the Origins of Religion and Magic. The first in a new series on the history of modern scholarship on magic. Very informative. BIBLIOGRAPHIA IRANICA: DNf: A New Inscription Emerges from the Shadow. DNf is that trilingual inscription found recently near the tomb of Darius the Great, noted here. Follow the first link above for the article that published the inscription. I have only had time to skim it. It is technical, but a good bit of it is reader friendly. Did Exodus revise the Code of Hammurapi? PROF. DAVID WRIGHT: How Exodus Revises the Laws of Hammurabi (TheTorah.com). A close look at the laws of assault recorded in Exodus’ Covenant Collection demonstrates that the author knew the Laws of Hammurabi and revised them to fit with Israelite legal and ethical conceptions. Could be. The question that occurs to me is could an Israelite legislator or scribe in the mid-monarchical period have had access to copies of the Code of Hammurapi (Hammurabi) and have read in it Assyrian Akkadian? Presumably Prof. Wright addresses that question in his 2009 book, which I have not seen. Rather than emphasize the fishermen’s moral decision to follow Jesus and its associated economic cost, I implore we instead read these narratives as embedded within a broader context of widespread social upheaval and as gesturing towards unrest among the lower classes. Chapter in Class Struggle in the New Testament (Lexington Books/Fortress Academic, 2019), pp. 115-137. Jesus wasn't a capitalist. But he wasn't a Marxist either. THIS WEEK'S DAF YOMI COLUMN BY ADAM KIRSCH IN TABLET: Offspring Fever. In this week’s ‘Daf Yomi,’ prohibitions against slaughtering the young of sacrificed livestock reveal the thoroughness and complexity of Talmudic study of contingencies. The first four chapters of Tractate Chullin went into great anatomical detail about the correct way to slaughter animals. But in Chapter 5, the focus shifted from sinews and windpipes to a seemingly simple rule that turns out to conceal a number of puzzles. Leviticus 22 lists several conditions that invalidate an animal for sacrifice, including this one: “And whether it is a bull or a sheep, you shall not slaughter it and its offspring both in one day.” It’s only a few words, but exploring their full implications turns out to take several pages of Talmudic debate. KARAITE WATCH: Tiny Jewish sect protests controversial Jerusalem cable car project. Planned Old City tourist attraction draws further criticism as Karaites warn construction is insult to community’s ancient cemetery (Ilan Ben Zion, AP). Review: the Karaites are a non-rabbinic community of Jews whose origin goes back at least to the early Middle Ages. They reject the rabbinic concept of the Oral Torah. It sounds as though there has been some miscommunication between the Jerusalem Development Authority and the Karaite community. I hope they are able to find a resolution. Closing in on the lost tomb of Alexander the Great? ARCHAEOLOGY: New clues to the lost tomb of Alexander the Great discovered in Egypt. Excavations in Alexandria's ancient royal quarter provide intriguing hints to the famous conqueror's final resting place (ERIN BLAKEMORE, National Geographic). Archaeologist Calliope Limneos-Papakosta has reached the earliest layer of ancient Alexandria's royal quarter and she is following leads that she hopes will take her to Alexander's tomb. APPREHENDED: Suspected smugglers of ancient coins nabbed. Suspects in western Kutahya province allegedly attempted to sell 5,000 Roman- and Byzantine-era coins (Anadolu Agency/Yeni Ṣafek). Noted for completeness. I have been following stories of the seizing of potentially interesting smuggled artifacts by the Turkish authorities. So far all of these have turned out to be of dubious authenticity or else genuine, but of recent vintage. These coins could be ancient. They could also be forgeries or they could be genuine, but relatively recent. The photo in the article is uninformative. We may never know. On balance, it hardly seems worthwhile to fake so many coins. Forgers would concentrate on faking a few valuable-seeming ones. So my assumption is that at least most of these coins are genuine, but (for whatever reason) of little market value. This story is also covered by the Daily Sabah with a few more details. Background here and many links. Cross-file under Numismatics. BIBLIOGRAPHIA IRANICA: Studies in Honor of Professor Shaul Shaked. Notice of a New Book: Friedmann, Yohanan & Etan Kohlberg (eds.). (2019). Studies in Honor of Professor Shaul Shaked. Jerusalem: Israel Academy of Sciences. Follow the link for the TOC. Looks like a great lineup of contributors and topics. Where Did the Temple Treasure Go? MORE ON THE TEMPLE TREASURES: A.D. 70 The Destruction of the Temple — Where Did the Temple Treasure Go? Part 1 (Carl Rasmussen, the Holy Land Photos' Blog). Part 1 tells where the Romans deposited the Temple treasures, but not what happened to them after that. Maybe in Part 2? The question becomes much harder to answer from that point. But there has been plenty of legend and speculation to fill in the gap. Meanwhile, at PaleoJudaica, the post just before this one is relevant to the question, especially when you follow the links. And see also here and links. BECAUSE YOU SHOULD KNOW THESE THINGS: What Is the Ark of the Covenant? (Owen Jarus, Live Science). A nice summary of the biblical evidence for the Ark, along with some speculation about possible pre-biblical form(s) and a survey of post-biblical legends. For past PaleoJudaica posts on the Ark of the Covenant, start here (cf. here and follow the links. For the legendary Treatise of the Vessels, which tells the supposed story of the fate of the Temple treasures and the Ark after the Babylonian destruction of the Temple, start here and follow the links. I published the first complete English translation of the Treatise of the Vessels back in 2013. Then five years ago Mr. Jarus broke that story in the media. That led to the Daily Mail naming me a "real-life Indiana Jones." PROF. LAWRENCE H. SCHIFFMAN: JERUSALEM AND ROME SPECIAL SPEAKER SERIES. The first lecture is on 25 March. Follow the link for ticket information. THE AWOL BLOG: 50 Years Journal for the Study of Judaism: Limited Open Access. ANCIENT JEW REVIEW: Paul, the Gentiles, and the Other(s) in Jewish Discourse (Cavan Concannon). Another installment in the AJR forum on Ophir and Rosen-Zvi, Goy, on which more here and links. THE ETC BLOG: Deuteronomy 33:2 in Textual and Linguistic Perspectives. John Meade interacts with some exegesis by Hendel and Joosten in How Old is the Hebrew Bible? BRYN MAYR CLASSICAL REVIEW: Yair Furstenberg (ed. ), Jewish and Christian Communal Identities in the Roman World. Ancient Judaism and Early Christianity, 94. Leiden; Boston: Brill, 2016. Pp. xi, 286. ISBN 9789004321212. $149.00. Reviewed by Bradley J. Bitner, Oak Hill College (bradb@oakhill.ac.uk). This is a stimulating, well-edited volume and will be useful to a wide range of ancient historians and scholars of Ancient Judaism and Early Christianity. The range of methods, sources and macro-/micro-historical perspectives employed is admirably wide. An ancient sources index would have been most welcome alongside the author and general indexes. Reflecting the increasing recognition of the importance of legal texts and issues in early Judaism, the essays in this collection examine halakhic and rule texts found at Qumran in light of the latest scholarship on text production, social organization, and material culture in early Judaism. The contributors present new interpretations of long-lived topics, such as the sobriquet “seekers of the smooth things,” the Treatise of the Two Spirits, and 4QMMT, and take up new approaches to purity issues, the role of the maśkil, and the Temple Scroll. The volume exemplifies the range of ways in which the Qumran legal texts help illuminate early Jewish culture as a whole. THIS IS STRANGE. AND SAD. Graffiti spray-painted on 1,800-year-old synagogue on Galilee’s Mount Meron. For the second time in four years, the 3rd-century house of prayer is vandalized by religious extremists near the tomb of the Talmudic sage Rabbi Shimon bar Yochai (Amanda Borschel-Dan, Times of Israel). The synagogue site, where no active digs are planned, is conserved as part of a government project and is part of a nature reserve. No archaeological park is planned for the area. The article mentions the graffiti vandalism of the same synagogue in 2015, which I noted here. For more on Mount Meron in connection with Rabbi Shimon bar Yochai (Yohai) and the annual Lag B'Omer celebrations, see here and links. For the tomb of Rabbi Shimon, see here and here and links. RELIGION PROF: Scripta Qumranica Electronica Post-doctoral Fellowship at the University of Haifa (James McGrath). The deadline for applications is 25 March, 2019. Don't dawdle! For more on the project, see here and links. More New Testament Apocrypha, volume 3! THE APOCRYPHICITY BLOG: More New Testament Apocrypha vol. 3. Tony Burke announces plans for a third volume of New Testament Apocrypha: More Noncanonical Scriptures. Volume 2 is now in the hands of the publisher, Eerdmans. Both announcements are good news. For a recent update on the progress of Old Testament Pseudepigrapha: More Noncanonical Scriptures, vol. 2 (MOTP2), see here. We have no plans for a third volume. UPDATE: I meant to add that you can read my four-part review of MNTA1 here and links. THE DUST BLOG: Biblical Studies Carnival 156 February 2019 (Bob MacDonald). The Lego Edition? Also see some comments on the Carnival by organizer Phil Long here. NUMISMATICS: CoinWeek Ancient Coin Series – The Seleucids and Their Coins: Part II (Mike Markowitz). Some of the Seleucids in this article are mentioned in the Book of Daniel, although not by name. Seleucid figures are in bold font in what follows. There is an error at the beginning of the article: Antiochus III the Great was the brother of Seleucus III, not his son. They both appear in Daniel 11:10 as "his [Seleucus II's] two sons. Then Antiochus III is the main subject of vv. 11-19 as "the king of the south." Seleucus IV Philopater appears in Daniel 11:20 as the "one who shall arise in his (Antiochus III's) place." The "exactor of tribute" whom he sends is Heliodorus, on whom more here and here and links. The "contemptible person" who follow in the succession (v. 21) is, of course, Antiochus IV Epiphanes, the most (in)famous Seleucid figure in the Bible. He is the "little horn" in Daniel chapter 7. His decree outlawing the practice of Judaism led to the Maccabean Revolt in 167-164 B.C.E. Daniel 11:21-39 mostly describe actual events in his reign, but vv. 40-45 are predictions of how his end would come about. We know they are predictions because, like most predictions of the future, they are completely wrong. Those events never happened and Antiochus met his end in Persia, which does not figure at all in them. The Maccabean Revolt is chronicled in much more comprehensible form in the books of 1-2 Maccabees. I noted Part I of this series here. Also there, see a link for more on the Seleucids. And also see another link there to an earlier series by the same author on the Ptolemaic coins, which covers some of the same history in the current article. APPREHENDED: 800-year-old Hebrew book seized in southeastern Turkey’s Diyarbakır (The Daily Sabah). Turkish security forces continue diligently taking fakes off of the antiquities market. There are a couple of not-as-bad-as-usual photographs of this "book." 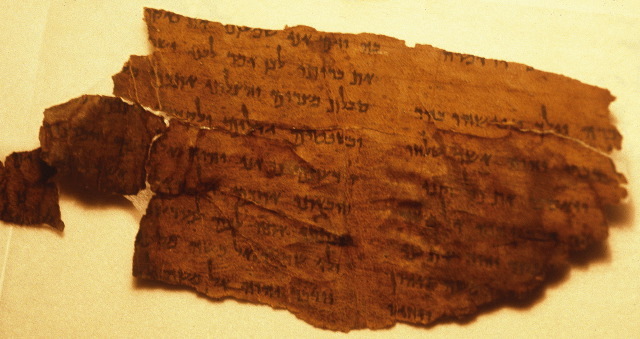 The page containing Hebrew writing looks as though it came from somewhere else and has been cut down badly to fit as a page of the current book. The printed (! - not handwritten) Hebrew is vocalized. Thanks to detective work by Avi Kallenbach at the Hebrew Codicology and Paleography page at Facebook, the text can be identified as from a Hebrew translation (possibly the 1937 one by A. Kahana) of 1 Maccabees. The drawings of the people in the other pages look vaguely to me like something in a Christian tradition. But I am not an art historian and my impressions are not authoritative. The Hebrew letters on the left side of the second photo look crudely handwritten. I don't know where these articles get the supposed ages of these seized manuscripts. This is a modern fake, probably cobbled together out of a couple of different sources. All commenters at the Hebrew Codicology and Paleography Facebook page agree it is a fake. This and the other recent Hebrew book surfacing in Turkey have generated a mixture of exasperation and mirth over there. You should join, if you are interested in such matters. For other similar stories coming out of Turkey, start here and follow the many links. ANCIENT JEW REVIEW: The Goy: A Synchronic Proposal (Christine Hayes). Another installment in the AJR forum on Ophir and Rosen-Zvi, Goy, on which more here, here, and here. CANDIDA MOSS: Jesus v. Apollonius: The Ancient Debate Over the Real Son of God. The answer as to how many claimed to be the real son of God: more than you would think (The Daily Beast). Posts on the recent (largely bogus) documentary that started this discussion are here and here. But it is good to be having the discussion. The first century did not see off the last of the messianic figures in this mold. Think, for example, of the mystical messiah of sin, Shabbetai Zvi in the 1660s. RENOVATION UPDATE: In Rome, spectacular ancient Jewish catacomb’s opening haunted by delays. Under the sprawling estate of Villa Torlonia, Mussolini’s home for 18 years, is a 4th century cemetery housing some 3,800 Jewish graves. The question now is, when can they be seen? (ROSSELLA TERCATIN, Times of Israel). Soon, I hope. It was discovered that there are roughly 3,800 graves in the cemetery under the villa, which covers more that 13,000 square meters (140,000 square feet). It has been excavated over multiple levels and is one of the few Jewish catacombs in Rome among dozens of Christian subterranean tomb sites. The cemetery also contains a treasure trove of information that unravels mysteries about what Jewish life looked like more than 1,500 years ago in a city that has had an organized Jewish presence for the last two millennia. But as the excavations to explore it have progressed, the site also prompted complex questions as to how to preserve the peace of those buried there, as is stringently required by Jewish law. The Chief Rabbi of Rome and an Israeli archaeologist were involved. I have been following this story for years. For past posts on the Jewish catacombs at the Villa Torlonia (the subject of this article) and elsewhere in Rome, start here and follow the links. VARIANT READINGS: Burning Papyri (Brent Nongbri). The line that “the natives burn the ancient manuscripts” surely serves American and European scholars and collectors in justifying their acquisition of ancient manuscripts (“rescuing” them, to use the standard terminology). That’s not to say that such burnings never happened. Yes, that about sums it up. But read the whole post for some interesting, and even entertaining, specifics. The trope is also found for more recent manuscripts. There was a story to the effect that in the 1640s the cook baked her pies on pages from some newly-rediscovered papers of the sixteenth-century English Renaissance polymath and visionary magician John Dee. THE AWOL BLOG: Archaeological Atlas of Coptic Literature. Cross-file under Social Geography. Together with the start of the earliest Christian psalm commentary, there arose a series of brief introductory texts to the psalter, which continued to have an impact until the modern era. The volume contains the texts by Origen and Eusebius, presented in a new critical edition with translation and commentary. Two essays and color illustrations augment this first-ever complete, compiled collection.